Earlier this year I interviewed 2008 Olympic Silver medal winner and 2010 World Time Trial Champion Emma Pooley. A demon cyclist wtih a background that started in triathlon, Emma was planning to race some triathlons again in 2013, including the debut of the Swissman Xtreme Triathlon and Ironman Switzerland (Emma is based and lives in Switzerland). Emma raced in both of those events - winning Swissman and finishing fifth at Ironman Switzerland, while still racing for her Bigla cycling team. We're not sure on Emma's plans (or not) for triathlon in 2014, but judging by her performance this past weekend, we haven't yet seen the best of Emma Pooley over the Ironman... should she choose that direction next year. 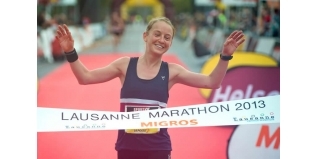 On Sunday Emma raced - and won - the Lausanne Marathon in a very speedy time of 2:44:28, which placed her ninth overall. Full results from Lausanne HERE. Last month, Emma also took part in the infamous Jungfrau Marathon, where she placed sixth lady of the 950 finishers. That is a seriously tough race - check out this profile to see why.